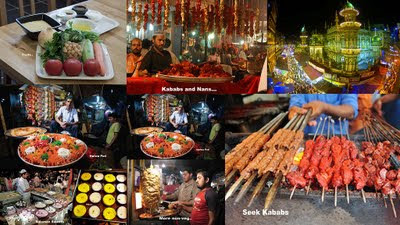 Food Trip - A Trip for People who Love to Feast with Eyes, Ears, Nose, Tongue and all their Heart..
Food Trip to Nagpada, Bhindi Bazaar and Mohammed Ali Road.. A Walking trip to treat your apatite..
All types of Kababs, Nans, Halwa Puris, Mal Puaa and more.. see detailed list below the picture.. Date and Day: August 26 (8pm). at Entrance of Nagpada or meet us later at the food stalls, just call us..
End Time: No fixed end time.. you may checkout whenever you like..
Paya Nalli, Mutton, Tail and Toungue stirred and Simmered for hours and yield a thick, delicately flavoured gravy. Divine patrel valiya ni biryani, which, as the name suggests, is a biryani made out of patrel instead of rice.